I saw an ad on a bus for Black History Month, sponsored by Heineken. It was asinine. Luckily, Steven Colbert already adequately addressed the issue. Let's be real here, this doesn't just happen during black history month. What about those damn mcdonalds commercials where the black kid is aspiring to be a manager at mcdonalds. Not knocking mcdonalds managers b/c they can make decent bread, but cleaning out grease traps and cussing out customers at a micky d's on 125 isn't my idea of a dream job. a white castle on fordham rd? different story. And I think your real beef here isn't b/c the "love child" is black. 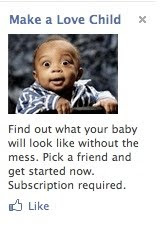 I thinks it's b/c the baby looks like Ja Rule.